I am in Lithuania for a basketball tourney and I took time out to visit the famous tourist attraction. The castle is located on a small island in a lake about 30 kilometers outside of the capital Vilnius. My friend Metin and his driver Hakan, were gracious hosts and they showed me the site. It was very strange in that Lithuania looks very much like my home of northern Michigan. With the mixed pine forests, rolling hills, and numerous lakes, I felt like I was back in my beloved Upper Peninsula of Michigan. But we don’t have castles from the 14th century! What a juxtaposition in my psyche. The castle is completely renovated and several of the rooms are now used to house museum pieces and explain the history of the site. There is also a small restaurant serving a pasty-like local delicacy. It gave me a feeling of how it must have been so long ago. It would have been quite scary to live in the castle, surrounded by miles of thick forests. 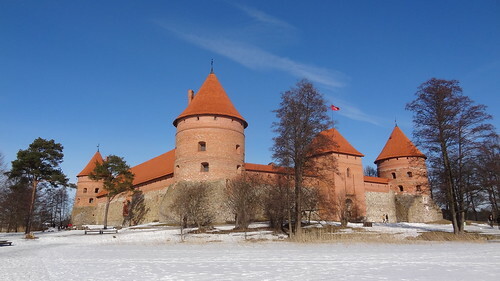 The castle was sacked by the Teutonic Knights (Germans) in 1377 and the site of civil war between LIthuanian ruling brothers. I spent some time in the stocks (below) and want to take one back for my school. It would serve as a deterrent for bad behavior. 🙂 The place must be even more beautiful in the summer. A big thanks to Metin for an interesting afternoon!